Posted on Tue 16 Jul 2013 at 5:20 PM PST. Filed under Religion. The wars continue on. There are these who say there’s a God, these who say that there isn’t one, and everything in between. I spent many years as a Christian Orthodox, then an Atheist, and now I identify with New Age Spirituality. The problem with spirituality is that atheists see it as religion, and religious people see it either as atheism, or as something heretic and distorted. However, I don’t consider this type of Spirituality to be a religion. I don’t even consider it strictly a “belief” either, because there’s at least some degree of proof in it. Neither I consider it atheism. To me, it’s just the natural order of things in the universe. Religion: I believe that this keyboard exists. I was told it does, and I have faith that it does. Atheism: The keyboard doesn’t exist. End of story. Agnosticism: I don’t know if the keyboard exists or not, there’s no proof of any kind. Spirituality: The keyboard exists. I can see it with my own eyes, so I have personal proof. Religion in the modern times seems to be prescribed as anything that is unattainable and mystical. It’s all a mystery. God did this, God did that, God said this or that, you should fear God, you can’t understand God. This is the crux of all “pop” religions, as I call them. Be it Abrahamic religions, or the “pop” versions of Eastern religions, it’s all about fear, silly ritual, and organized endeavors. The few that do get these religions right are usually only monks and mystics. The rest of the population, is simply controlled by religion, they live in fear, and in blind superstition. Spirituality on the other hand, is freedom. There is no organized cult behind it, and there is no fear. There is no control, or dogmas. There is only one teaching: LOVE. Everything else, is secondary. Spirituality proves to the individual by his/her personal experience that everything is One. That there is a loving consciousness where everything interconnects, making us all part of this same Source Being. Some would call this “God”, and that’s ok. Others could even call it simply, just “everything”. But as I said, Unconditional Love is the main teaching. Atheists do not believe that anything apart from themselves and the visible or scientifically-understandable universe exists. While they’re usually open to ideas of parallel universes and such (as proposed by math or quantum physics), the idea they resist the most is that that there’s a God. There are atheists who just in need of proof, and there are atheists simply because they hate what religions have become and they see no point in believing in a ruthless God (nor do I, for that matter). Obviously, spirituality is not atheism per se, since it accepts that there are realms beyond the visible, and of course, it accepts that a person can attain knowledge that we’re all part of the same Source Being/Consciousness. The difference with both religion and atheism is that with Spirituality you can have personal proof that God exists. You can feel, and see “God” right in front of your eyes. This is not something that the vast majority of traditionally religious people can claim. Most of these believers live in the dark ages of “blind faith”. Of course, personal proof is not scientific proof, but that’s just because science hasn’t reached that level yet, being able to detect higher frequencies of Being, which are also full of life. But the point is, that these realms are real enough for the person experiencing them to transform him/her. Why do you need an experiment to tell you that what you see in front of you is real or not? If it looks like a duck, walks like a duck, and quacks like a duck, it’s probably a duck. Even if it ends up being a powerful hallucination, it’s real-enough to the person who experienced it. What is “real” anyway? Physics haven’t even answered that yet! Experiences range from astral projection to other planets, to other realms that live in different frequencies, to time travel, to parallel timelines, to different universe bubbles, but the ultimate destination is to be connected with Source. When you do, then all the knowledge of what has ever been, is, and ever will be, is yours (although, you’re not “you” anymore, as you will also experience what is called “ego death” in order to connect with All). While One with the One, you will feel unconditional love for all, a type of divine ecstasy and acceptance that it can’t be felt while on your human body. It’s a type of feeling that is not analogous to the feelings we can experience while in our 3rd density/dimension body. 1. The easiest ways are via DMT/Ayahuasca, or high doses of magic mushrooms, LSD, and possibly mescaline (I’d avoid Salvia, it transports you to lower densities instead of higher ones). The public has been conditioned to believe that these “drugs” produce hallucinations, or that they’re dangerous. I believe that the government is just myopic on that respect. If you start reading DMT trip reports, you will find yourself puzzled about the similarity of reports on the various realms. There is a plethora of aliens or higher beings contacted via DMT, but some have canning similarities between reports. For example, the “machine elfs”, or the beings of Pure Light. The lower astral parasites that feed on your energy, and the “demons” (possibly life forms that simply evolved to ingest life force from souls in order to survive). These drug trips, especially on DMT, look more real than real to the user. With LSD and mushrooms, which are less intense and don’t always transport you to other realms, you can experience telepathy and literally see the fractals that constitute our “holographic reality”. I mean, it’s surely of wonder how when high on some of these substances you can see an entity flying around your room that you never noticed before, only to have your dog chasing and barking at it at the same time. Makes you wonder. A small amount of people on hallucinogenics have connected with Source. They don’t always attain its high frequency, most of the time they end up somewhere in the middle of all things. It’s a crapshoot. 2. Meditation. This is the harder way, but also the best way in both astral safety, and navigating through the higher realms, to eventually reach Source. It might take years before you do, but when you do, you’re truly Enlightened, and the connection doesn’t get severed (as it does with hallucinogens, that simply offer a glimpse of what is). At the end, no matter what I write, atheists will break apart this article picking on words and sentences, and the religious people would do exactly the same thing. But it doesn’t matter. Personal proof is all I need. I need neither our existing (limited) science, nor blind faith. The middle road works for me for now. If anything, I continue to live a type of life that is more akin to an atheist (in terms of not interfering with other people’s freedoms as some Christians/Muslims do). My day to day life hasn’t changed one bit when I became Spiritual. All it changed was the way I viewed the Cosmos. I do not feel alone anymore, there’s life everywhere. I now don’t fear death because I’m Eternal. 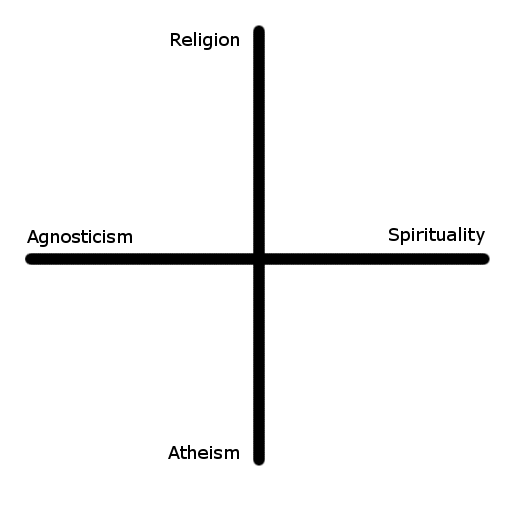 I think it’s a false dichotomy to suggest that spirituality is antithetical to atheism. Just because I don’t believe in God doesn’t mean I don’t have a spiritual life! In fact I feel like I have an intensely spiritual life, though it’s absent gods. There are churches in Berkeley that welcome spiritual atheists! I never personified God above. In fact, I mentioned that God is “everything”, which is obviously not one, single person or spirit. I find it to be some form of universal consciousnesses or web, that connects everything. So, some people, simply call this “awe of nature” (as in your case), and some people call it God (e.g. Kabbalah). BTW, I was very surprised how close Kabbalah is to Buddhism, and New Age spirituality. None of these mystical traditions personify God. Only “pop” religions that 99% of the religious population follow personify God, as I mentioned in my post. So from that sense, all these traditions are atheistic in nature, by your definition! Therefore, I don’t think that our difference is in the definition of the word “spiritualism”, but rather in the definition of the word “God”. You might be as close to these same beliefs as mine, and yet simply not call Nature “God”. But that’s just a label, isn’t it? For example, you might find yourself at awe of Yosemite’s mountains and waters, trying to enjoy its beauty over the weekend, while I’m busy trying to see the fractals and atoms and its added dimensions that exist in and all around Yosemite, and trying to connect with it in its most fundamental level. It’s the exact same thing that we’re doing, just from a different point of view. You’re doing it from the emotional, 3D point of view (which is absolutely valid and respected), I try to do it from a more deconstructive dimension. In both cases, either you call it “enjoying Nature”, or “plugin into the Matrix”, it’s the same thing, because they’re equally valid experiences. We both experience Yosemite! Ah! I didn’t mean to imply that YOU personified god, only that that’s the common dichotomy. Many people feel that you can’t have a spiritual life if you’re an atheist, when, as you say, we may all experience the same level of awe when beholding Yosemite, or contemplating fractals. However, you do say above “The problem with spirituality is that atheists see it as religion” and I strongly disagree with that statement. I mostly have in mind “Reddit atheists” when I’m talking about atheism. That sort of lot, don’t have any room for spirituality. They see it as religion, regardless. I have no time for soul-less atheists. Ha! The adjective form would be “Awesome”! BTW Eugenia, I’m totally digging your latest writings on religion and psychedelics. Good stuff. 1. You’re able to feel your self, consciously present at the keyboard. 2. You’re able to feel into the keyboard, and sense its world. 3. You’re able to experience the interaction between you and the keyboard. In other words, you sense the essentials of You, you sense the essentials of the keyboard, and you feel into their interaction. It’s at the interaction point that includes them both, while they each maintain their identity, where it becomes mystical, and transcends the world of the ordinary. Though some people take drugs to do this, the side effects interfere, because to really integrate the experience, you need to be clear enough in mind and body to have the experience in a clean, consciously chosen way. merely conjecturing, and so their theories are just two sides of the same coin — don’t tell them that, as it would unduly perturb them.